The Triumph TR250 sports car. Originally, Triumph had planned to replace the TR4A with the TR6 in mid 1967. However, according to legend, the TR6's designers, Karmann, provided Triumph with the tooling specifications, incorrectly, in metric units. This error set back the launch of the TR6. Consequently, as a stop gap measure lasting a year, a design for the TR250 was quickly put in place to satisfy the US market. In 1967, the TR250 sports car was introduced at the same time as the launch of the TR5. Externally, apart from the grille, there was virtually no difference between the two, nor with the TR4A, the car they were replacing. However, a notable styling feature was a transverse speed stripe across the bonnet of the TR250, which also displayed a distinctive "TR250" badge. There was a similar badge on the rear wings, and one saying "Triumph TR250" on the boot. The TR5 was designed for the UK and European markets, and none were exported to the US. On the other hand, the TR250 was aimed specifically at the US market, and was only available as a LHD version. The Lucas fuel injection system on the TR5 did not meet the strict US emission control regulations. Since any modifications to this system could turn out to be unduly expensive, it was decided to look for an alternative. The solution was to use the same 2.5 litre, straight 6-cylinder engine as the TR5, but instead of fuel injection, to incorporate two Stromberg carburettors developing 104 bhp, ironically the same as that produced from the TR4A. This engine was a direct descendent from that used in the Triumph 2000 saloon car, which developed 90 bhp, but bored out to 2.5 litres and fitted with a modified camshaft. 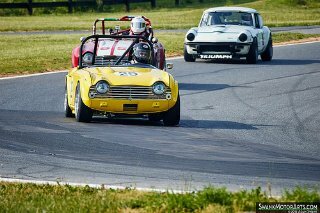 The result was a power increase of 60 bhp for the TR5, and 14 bhp for the TR250. However, the substitution of carburettors in place of fuel injection had an adverse effect on performance, with power output, top speed, and 0-60 times all suffering. Alternatively, compared with the TR4A, the torque increased from 128 to 152 lb-ft, which made even the carburetted version a very smooth engine. Further, with its 0-60 in around 10 secs, it was in the same league as the Austin Healey 3000. On the downside, even with independent suspension, the nose would rise up on acceleration and dive on breaking, and the ride was somewhat bouncy. The TR250 was an immediate success in the US, and far outsold the TR5. A 1967-68 Triumph TR250, in good condition, could fetch around £16,000/$25,000, whilst an example that was an ideal restoration project would be worth around £5,000/$8,000.